The Film Noir Blogathon is hosted by The Midnite Drive-In from August 12-14. Click HERE for all the dangerous dames and dirty dogs. 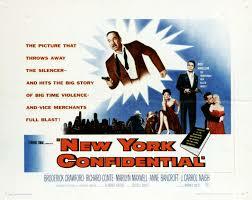 I can't resist those mean streets and am thrilled to contribute a look at 1955s New York Confidential. 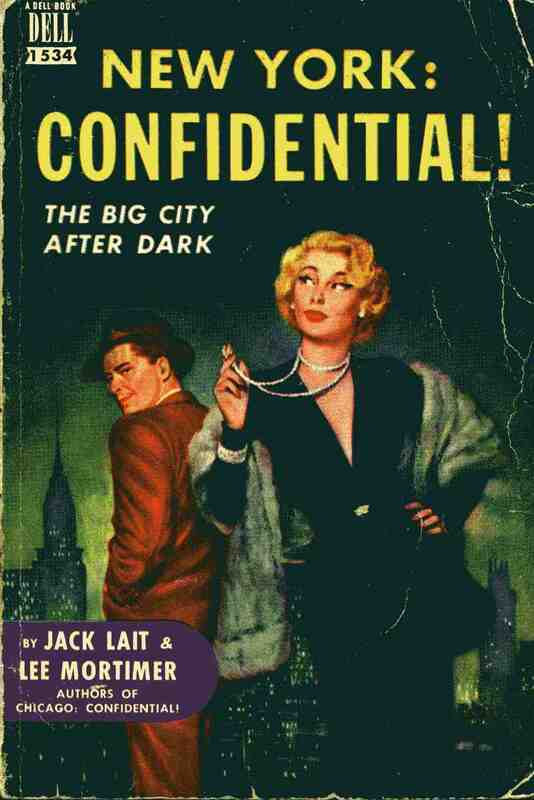 Newspaper journalists Jack Lait and Lee Mortimer published a series of crime books in the 1940s and 50s, the first being 1948s New York Confidential. Follow-ups include Chicago Confidential, Washington Confidential and U.S.A. Confidential. The books detail the night life of their respective cities and purport to blow the lid off of the workings of the crime syndicates - payoffs, rub-outs, graft, the whole dirty business. Russell Rouse and Clarence Greene co-wrote the screenplay (D.O.A., Pillow Talk, The Well) with Rouse directing New York Confidential for Edward Small Productions. Given the journalistic background, the movie starts off with a narration and the feel of a docudrama as a broad outline of the reach of organized crime is related and we are introduced to the suits who run the operation. It sounds like Reed Hadley narrating, or is it that all narrators start to sound like Reed Hadley after a while? The big boss of the New York operation is Charlie Lupo (Broderick Crawford). The suit and office can't hide the fact that this man is a hoodlum who came up through the ranks. It is in his language and demeanour. His right-hand man Ben Dagajanian (J. Carroll Naish) is a much calmer man, necessary for balance in this tense business. The two men are such close friends that Charlie's daughter Kathy (Anne Bancroft) calls Dagajanian "Uncle Ben". An unauthorized and strictly personal hit which happens to take out two innocent bystanders begins our picture. Nobody is bigger than the syndicate (remember that). It is voted that the errant mobster must be taken out for his transgression. This is a tough boy so an out-of-towner is selected for the job. Johnny Achilles (Onslow Stevens) who runs the Chicago turf sends one of his best, Nick Magellan (Richard Conte). Magellan is confident, ambitious and loyal. He also happens to be the son of an old friend of Lupo's, so when the NYC job is carried out to everyone's satisfaction, Achilles approves a transfer, if you will, of Nick Magellan's services from Achilles to Lupo. Nick is immediately accepted into the inner circle, acquiring a wardrobe befitting his rarefied status and the attention of two women. Iris Palmer (Marilyn Maxwell) is Charlie Lupo's high maintenance girlfriend. While we can't say we've ever seen her disloyal to Charlie, she has a yen for expensive things, good times and the good looking hit man. Nick tells her "There's one thing you learn in my business. Stick to your own territory." Kathy Lupo (Anne Bancroft) is filled with conflict. She loves her family, father and grandmother (Celia Lovsky), but hates her father's life. She has been well-educated and has fallen for a man whose society-conscious family scorn her background. She wants a simple, decent life for herself. Kathy's longing and the steps she takes to claim a life of her own touch Nick. He tries to get Kathy to understand the world as he sees it. Nick: "See that busboy? He steals from the waiter. The waiter steals from the boss and the boss cheats the government. That's the way it is." Kathy: "If I thought that was the way it was I wouldn't want to live." Kathy's vibrant and confused personality touches Nick's emotional core. Keeping her secret existence from her father is Nick's only act that violates his code of ethics regarding the syndicate. When it comes to business, Nick is a cold as ice professional and the killings mount up in the movie. Not everyone is thrilled with Nick's rise to the top. There is no sense of brotherhood of craftsmen between Nick and Arnie Wendler (Mike Mazurski), current go-to hitman in the Lupo organization. Could this tension lead to trouble somewhere down the line? On the home front Mama Lupo (Celia Lovsky) is in a constant state of worry about her boy Charlie. "It's like the old days, hiding out and guns. It's like the old days." She also worries about Charlie and Kathy's relationship, advising him to let his daughter go and find the life she wants. These touches go a small way to humanizing Charlie Lupo, along with his doctor's orders to avoid the foods he loves. Hey, he's just like any of us with troubles at home and on the job. Only his job involves cheating and killing. No big deal. The criminal business reaches all the way to Washington and billions of dollars are at stake when a bought off politician decides to spill. Charlie complains that you can't trust the hypocritical pigs. Ain't it the truth! New York Confidential sometimes has difficulties combining the documentary style with the emotional story told and as a consequence both aspects suffer somewhat. Nonetheless, I still find the criminal element of the film fascinating as the dots are connected between the syndicate and their bought politicians. The planning of the hits and the board room meetings also capture the imagination. The performances from Richard Conte and Anne Bancroft are a highlight as these two characters touch without touching and make an indelible impact on each other. As in the best of film-noir, do not look for a happy ending. In fact, when it comes to crooks, don't look for an ending at all. As always, I love visiting your blog! For me, Richard Conte is the King of Noir and this movie is one of the reasons he wears the crown. "Don't Bother to Knock" is a quirky picture, isn't it? The Anne Bancroft in that movie is not the Anne Bancroft we came to know. I Agee with your take on this. Definitely worth seeing though. For me, anything with Conte is worth watching. True. One of the most compelling of screen actors. His ability to be so completely always in the moment fascinates me. I see Richard Conte's name popping up a few times in this blogathon, and no wonder! He's tailor-made for the film noir genre. Even though I have this film on a Film Noir DVD collection, I've not yet seen it. Not sure why that is, especially now that I've read your fab review. Despite any shortcomings, it sounds like a worthwhile film. The worthwhile elements to the film, especially Conte - the King of Noir, make it a worthwhile watch. Lots of little touches you will enjoy. I knew going in that I shouldn't read this...because I'm saving my DVD copy of the movie for a future "Where's That Been?" column at ClassicFlix. But then again, I don't always fo what I'm supposed to do. Splendid review, Our Lady of Great Caftan. You rebel, you. You never do what you are supposed to. However, I'm pleased as punch you like the review. Great write-up. Conte always SO good. Always. Never disappoints. Conte, being the King of Noir, rules! This sounds like an interesting picture. Thanks for the write-up. If you want to see a very atypical Ann Bancroft role watch her in "The Girl with Black Stockings." I think she also had a weird role in a movie with Raymond Burr and a gorilla, or am I dreaming? No dream. You're thinking of 1954's Gorilla at Large. Our Anne made a lot of unusual pictures, even after she became a star. "The Girl in Black Stockings" is a favourite of mine for John Dehner. And I'll watch that silly gorilla movie any time because of my fellow Canuck Raymond Burr. I recently purchased this to add to my noir collection...I'd never seen it before (and still haven't, yet) but I liked the premise. And Richard Conte...so cool in noir films. I think my favorite of his would be 'The Big Combo', or maybe 'Thieves' Highway'. Nice post, Patricia! 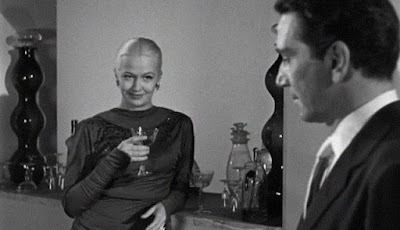 Conte is irresistible, especially in noir. "The Big Combo" tops my list, but a few years ago I saw "Thieves' Highway" on the big screen and that was a grand experience. I'm getting a huge list together of movies I've got to find with this blogathon. Nice review. Aha, that was your plan all along, wasn't it? My own must-watch list is burgeoning as well. I enjoy these gritty urban pics of the 1950s and this one has a great cast with a young Anne Bancroft, the reliable Richard Conte, and the cool beauty Marilyn Maxwell. I'm surprised this pic isn't better known! I find that surprising as well. I imagine at the time it was produced, it had quite the campaign what with the popularity of the novels and all. Apparently, it also spawned a TV series at the time. Interesting stuff. I'm sure this is a movie you will be glad you watched. Excellent review. Can never go wrong with Richard Conte! I also liked your final line 'When it comes to crooks, don't look for an ending at all'. Spot on! My appreciation for Conte continues to grow through the years and all of his work in film-noir is worthwhile. This looks quite interesting, especially for the ways it's different from "typical" noirs, like the "non-fiction" aspect. It is the perfect choice when you want something familiar, but not the same old thing. I think I'll need a rainy day to watch all the film noir recommendations from this blogathon. Broderick Crawford is great, but you really have won me with Anne Bancroft in the cast! The "new" movies we discover through blogathons may be my favourite thing. Calling Lait and Mortimer journalists, or NEW YORK CONFIDENTIAL a novel, might be too kind...I read it about 30 or so years ago, out of curiosity after learning of their putative contribution to the "upgraded" AMAZING STORIES magazine, "Mars Confidential!" (probably ghosted by editor Howard Browne, as was the story attributed to Mickey Spillane in a contemporary issue of its companion magazine FANTASTIC). Though I've yet to read it, the only issue of the crime-fiction magazine Ziff-Davis let Browne edit for them, CONFLICT, also featured a "Hollywood Confidential" attributed to L&M, and possibly actually written by them. (Not long after, Browne left the magazines and began his Hollywood career.) They were tabloid assemblies, as you say, a mixture of nightlife reviews, police-blotter rehash and typical sleazy gossip...it's not accident that the most popular scandal magazine of not long after was titled CONFIDENTIAL...it would take THE NATIONAL ENQUIRER and its peers a while to get the kind of cultural currency that magazine had in the mid 1950s..The film could only be a bit of a hash unless they left the book altogether behind, but this sounds like about as good a film as one could make from it...and Anne Bancroft is a powerful draw to me as well. Thanks! I get the feeling that it was the exploitative cache of the title that moved the movie forward. I think they came up with an interesting little movie and, of course Bancroft and Conte raise its bar tremendously.